On February 25, 1836, Sam Colt patented his cap and ball revolver that would give rise to all the modern revolvers that followed. We previously discussed this important event in firearms evolution in our article “Sam Colt Patents His Revolver” and also listed “10 Best Revolvers of All Time” among our many articles about firearms. This time we address those revolvers we would like to personally own above all others, if of course money was no object. While we are firmly in the semi-automatic pistol camp for carrying a military, police, or personal protection handgun, we recognize the value of revolvers in each of those roles, and the superiority of the revolver for handgun hunting. Questions for Students (and others): Are you a fan of revolvers or do you prefer semi-automatic pistols? If you could own just 1 revolver, which would you choose? Smith & Wesson 460 Magnum. Customized Smith & Wesson Model 460XVR showing factory sights and barrel detail. Photograph by Ainat00. It is a tough choice between the 500 Smith & Wesson Magnum and the 460, with the 500 having more “power” than any normal pistol cartridge ever, but the 460 having the highest velocity of any normal (ie., non-rifle) pistol cartridge firing handgun. The deciding factor in choosing the 460 over the 500 is simply versatility. The 460 can use full power loads for the heaviest of North American game hunting but be loaded downward with .454 Casull or .45 Long Colt cartridges for less demanding work. The other ammunition may even cost less and will certainly provide a less punishing shooting experience. We would choose a stainless steel finish for weather durability and probably use our fictional unlimited bank account to opt for the Model 460XVR, a revolver boasting a 12 inch barrel which would make the most out of the ammunition performance and sling swivels to make carrying the behemoth easier. With an accessory rail (Picatinny rail) on top, the revolver is ready for whatever type of scope or optics you would like to mount. Like most Smith & Wesson revolvers, the action is single action/double action to give the shooter a tad more versatility in its use, single action for precision and double action for speed, as in defending oneself against a charging dangerous animal. MSRP is about $1689 without accessories. Honorable Mention: Ruger Super Redhawk in .44 Magnum with a 6 inch barrel, stainless finish and topped with a 4 power scope. Once again, the ability to also shoot .44 Special ammo gives it some versatility and having a .44 Magnum is more or less a rite of passage for any revolver collector. Colt Pythons with 6-inch (15 cm) and 4-inch (10 cm) barrels and nickel finish. Photograph by Jeff Dean at German Wikipedia. These “snake” guns have been out of production since 2005, and have rocketed in value over the past few years. Their intricate workings and smooth operation are just not commercially feasible in today’s manufacturing atmosphere of investment casting and cost saving automatic machinery. The milling and hand fitting that went into the Python would be prohibitively expensive for any but custom manufacturers to contemplate today. First offered in 1955 (coincidentally the same year as the Smith & Wesson M29 .44 Magnum), the Python was the top of the line Colt. My ideal Python would be a shiny Nickel finish sporting a 6 inch barrel. The .357 Magnum cartridge is highly versatile for self defense and hunting smallish and medium sized game, including varmints, coyotes, deer and hogs, and the ability to use low cost and low recoil .38 Special ammunition makes shooting economical and less tiring than blasting away with full power loads. A Python would be a terrific revolver in an “open-carry” jurisdiction, kind of like driving a vintage Cadillac. It would also be just fine for home defense, a day at the range, or even hunting. Expect to shell out big bucks for one in good shape, anywhere from at least $1500 to well over $2000 or more. Much more for particularly collectible examples. The fact that “Rick Grimes” of The Walking Dead television series carries one is enough to drive up the price by itself. Ruger LCRx MODEL NUMBER: 5462, .327 Federal Magnum. Ruger LCR. Photograph by Jephthai. I have always liked the .32 S&W Long revolver as a pocket pistol and easy recoiling shooting iron, with Harrington & Richardson making some great inexpensive models over the years, but of course, they are now out of the revolver business. In choosing the LCRx we give props to the nicer than usual single action/double action trigger pull than most small revolvers exhibit, a major consideration in accuracy with a short barreled revolver meant for personal defense. The .327 Federal Magnum cartridge takes the .32 caliber into the realm of realistic self-defense performance, even more so than the .32 H&R Magnum that preceded it. With a 1.87 inch barrel, the little revolver is easy to conceal carry, and despite its flat black color, the metal is stainless steel for durability and ease of maintenance. Another great thing about the LCRx, is that it can just as easily shoot .32 S&W, .32 S&W Long, and .32 H&R Magnum cartridges, allowing you to tailor your chosen ammunition to either the situation or the availability of said ammo. Price is $669 and the cylinder holds 6 shots in the space a .38 would hold only 5 shots. H&R model 900, .22 Long Rifle. 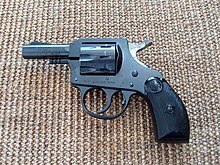 H&R model 900 9-shot .22 Revolver. Photograph by James Case from Philadelphia, Mississippi, U.S.A.
Why would I want a $100 gun that has been out of production since (around) 1986 or thereabouts? Because that is exactly what I want! A 9 shot cheap .22 revolver that is a blast to plink with. In the break-top style (Model 999) or the regular swing out cylinder (they made several varieties, 922, 929, etc. ), any of them will do. The main draw back of these simple, lightweight revolvers is the nylon block inside that is prone to break, so if you have one, it would not hurt to have the spare part. (About 25 years ago I found a metal, I think maybe aluminum, replacement part, but I do not recall what the part is called.) The ability of a .22 LR revolver to digest everything from CB and BB caps, to .22 Short, .22 Long, and .22 Long Rifle ammo of standard, high, or hyper-velocity power level makes it versatile and fun. Plus, revolvers also can use the .22 “snake” birdshot rounds. A blued finish with either a 4 inch barrel for general purpose plinking and hiking or even the 2.5 inch barrel would be acceptable. Why pay more for a nicer .22 like a Colt Woodsman or Ruger Bearcat when you could save dinero and not worry about your investment. As long as the gun is cared for and inspected it should be reliable. Honorable mention: One of those tiny little North American Arms single action mini-revolvers in .22 Long Rifle. While I do not believe they are really practical, it would be a hoot to own one for carrying around the property in my pocket and for plinking. A unique and incredibly cool pistol, the LeMat sported a 9 chambered cylinder in either .36 or .42 caliber, with a second single shot barrel going through the middle of the cylinder chambered in 20 gauge smooth bore for shooting buckshot. A large bulky gun, it weighed 3.1 pounds unloaded. Although it would certainly take a while to reload, having 9 pistol caliber shots and a single short barreled shotgun blasting a charge of buckshot gave the pistolero enormous firepower when equipped with a LeMat. Only 2900 of these fascinating guns were made, with some produced as carbines, and a few made in slightly smaller calibers (.35 and 28 gauge) to reduce weight and bulk. Made from 1856 to 1865 in Paris, Philadelphia and London, the multiple caliber, multiple barrel revolvers are made today (since 1985) by Pietta of Italy and are sold in the United States. 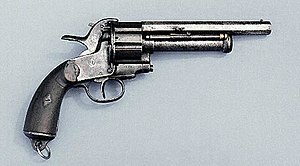 Attempts to modify the revolvers for use with pinfire and metallic cartridges were minor variants. LeMat revolvers were used mainly by the Army of the Confederate States of America during the Civil War. An original is out of the question, but reproductions are made that should be safe and fun to shoot, more for the fun of it than for any practical purpose. You could order one from Cabela’s for $899.99. Ruger Police Service Six, .357 Magnum. Ruger Security-Six in .357 Magnum. Photograph by MatthewVanitas. A utilitarian 4 inch barreled duty revolver that is rugged and reliable, and though it does not sport any adjustable sights or fancy doo-dads, it is about as serious and easy to use as they come. When you are carrying a sidearm for duty use, you may appreciate the fact that you cannot break what is not on the revolver, so no worries about fancy sights that can snag when drawing the pistol or break when you drop it. No worries about the batteries in the non-existent laser sight or flashlight, just rugged, deadly business. This revolver also makes a terrific glove compartment gun (when allowed by law) or nightstand gun, as well as a medium sized carry pistol. These wonderful revolvers were superseded by the fancier Security Six models and later by the GP-100 line of Ruger duty style revolvers. While the GP-100 currently retails for $899.99, I paid $130 even for a Police Service Six in 1977 (stamped “Made in the 200th Year of American Liberty,” in other words, 1976), and the revolver came with a box of hollow point ammunition and a leather holster no extra charge! Sure, the Ruger LCR, LCRx, SP-101, and GP-100 lines are great, but I will gladly take my old Service Six any day. Taurus Judge/Smith & Wesson Governor, .410/.45 Long Colt. 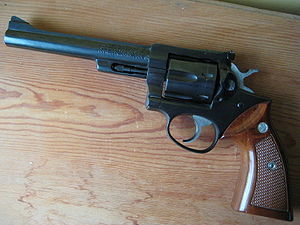 Taurus “Raging Judge Magnum” revolver with 6.5 inch barrel, chambered in .454 Casull, .45 Colt, and .410 bore shotshell. All Judge revolvers can also fire the short .45 Schofield (.45 S&W). Photograph by HarveyHenkelmann. Really more of a novelty than a necessity, these shootin’ irons that can launch .410 shot shells as well as .45 Long Colt ammo give tremendous versatility to these revolvers. Some models are restricted to 2 ½ inch shot shells, while others (called “magnum” models) can also fire the 3 inch .410 shells as well, with a commensurately longer cylinder and a bit higher price. Then there is the whopping RAGING JUDGE 513 (Taurus) that also lets the owner lob potent .454 Casull bullets downrange as well! Although offered in barrel lengths down to 3 inches, which is probably good for a hiking gun for defense against whatever critters pose a threat where you are hiking, the 6 inch barrel variety is probably easier to aim and shoot accurately. Cost is not cheap, with the RAGING JUDGE 513 coming in at $1,167.75. (The 2 ½ inch chambered 3 inch barrel blue steel Judge goes for $511.37, which is not too bad for an MSRP). The Smith & Wesson Governor with blued steel and a 2 ½ inch chamber, with a 2.75 inch barrel retails at $869.00, but it can also shoot .45 ACP ammo, a nice touch. Cunningham, Grant. Gun Digest Book of the Revolver. Gun Digest Books, 2011. Prasac, Max. Big-Bore Revolvers. Gun Digest Books, 2012. Prasac, Max. Gun Digest Book of Ruger Revolvers: The Definitive History. Gun Digest Books, 2014. The featured image in this article, an illustration of a Colt Texas Paterson 1836 (.40 cal) firearm with western motif courtesy of Colt’s Patent Firearms Manufacturing Company, is in the public domain in the United States. This applies to U.S. works where the copyright has expired, often because its first publication occurred prior to January 1, 1924. See this page for further explanation. Previous ArticleHow Many Countries Have Space Programs?